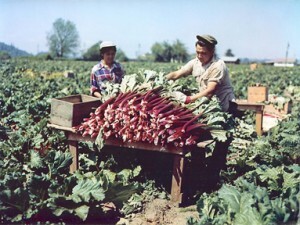 Sumner farmers started growing rhubarb when a blight took out the lucrative hops industry overnight. By 2007, approximately 27% of the nation’s acres growing rhubarb are found in and around Sumner with some farms now run by the fifth generation of rhubarb farmers. In the 2012 USDA Census of farming, the most acres in the nation that grow rhubarb for fresh markets (as opposed to processing) remains in Pierce County, Washington, right around Sumner. Learn more about this colorful history, the crate art and the details of growing this fascinating plant.